U.S. physicians are concerned over the recent discovery of a virulent strain of E.coli that is resistant to colistin, an antibiotic that was supposed to be used for emergencies. Doctors identified the resistant strain in a Pennsylvania woman suffering from a Urinary Tract Infection (UTI), which is particularly troubling given that UTIs are the second-most common bodily infection. Dr. David Hyun, a senior officer for the Antibiotic Resistance Project at Pew Charitable Trusts, says highly-resistant bacterial infections are more typically found in chronically-ill patients. UTIs, which account for about 8.1 million visits to health care providers each year, are a type of infection normally present in otherwise healthy individuals. The Pennsylvania case, says Hun, suggests that this resistant-bacteria, termed the mcr-1 gene, is becoming a broader threat. The colistin-resistant E.coli strain was previously reported in Europe, Canada, and China. Doctors first discovered it in China in 2015. The general hypothesis is that misuse of the colistin antibiotic by Chinese pig farmers enabled the E.coli bacteria to grow resistant. So far researchers have found this particular superbug in humans, pigs, and raw pork. The discovery of the mcr-1 gene, named by Pennsylvania researchers who identified it, is alarming for two key reasons: “The first reason,” says Hyun, “is that colistin is an antibiotic that we consider to be a last-resort antibiotic. It is what we turn to when an infection is resistant to all other types of antibiotics.” If a strain of bacteria has developed a resistance to colistin, that increases the threat of all superbugs. The second alarming factor about the mcr-1 gene is its mobility. Meaning, the gene can be easily transferred between different species. The mcr-1 gene lives on a genetic element called a plasmid, a cellular structure that can reproduce distinctively from chromosomes. Because the mcr-q1gene is located on a plasmid, it can be transferred from bacterial species to bacterial species. That’s especially dangerous, according to Hyun. He believes this mobility could allow the mcr-1 gene to converge with other bacteria and create a super superbug. In recent years, physicians, researchers, and public health officials have become increasingly worried about the growth of superbugs—strains of bacteria that multiple types of drugs cannot destroy, making infections difficult to treat or contain. Any strain of bacteria can evolve into a superbug, with the primary cause of this evolution being antibiotic misuse. When doctors overprescribe or incorrectly prescribe antibiotics—or when patients fail to complete a prescribed course of antibiotics—bacteria develop irreversible resistance drugs. Antibiotic abuse is also relevant when it comes to livestock. Let’s remember that antibiotics were not created to be given as a preventative measure. Which is exactly what happened with Colistin. Because it’s cheap, it was given to livestock to make them put on muscle mass faster, and protect them from the conditions of intensive farming. According to the Centers for Disease Control and Prevention (CDC) , two million Americans develop bacterial infections that are resistant to antibiotics every year, with roughly one percent dying from the infection. 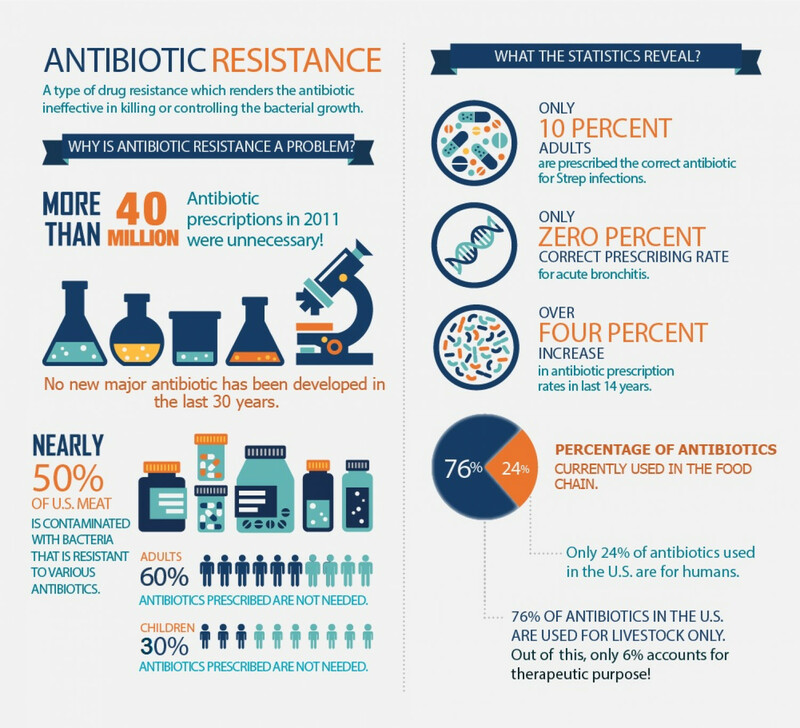 Antibiotic resistance is an urgent and dangerous phenomenon: antibiotics have been essential to all kinds of life-saving medical treatments, including chemotherapy, organ transplant, and preventing infection from childbirth and surgery. Until now, the American government and medical community have been more concerned with the threat posed by other drug-resistant strains of bacteria. A 2015 White House report specifically named the following bacteria as most urgent: methicillin-resistant Staphylococcus aureus (MRSA), Clostridium difficile (C. diff), Carbapenem-Resistant Enterobacteriaceae (CRE), and Neisseria gonorrhoeae (a strain of the gonorrhea STD). Preventing the continued development of superbugs requires a number of changes to the way we handle food and treat disease. Researchers who study antibiotics and infectious diseases recommend prohibiting both the overuse of antibiotics in livestock and the practice of keeping live animals near food products on farms and at markets. Public health officials are calling for clinicians to exhibit caution when prescribing antibiotics, and to discuss proper drug use with patients. There are already significant efforts underway to combat this problem. Keep Antibiotics Working, a national campaign to end antibiotic overuse, brings together groups from multiple industries to fight the misuse of antibiotics in food animals. Dr. Hyun calls this latter approach “antibiotic stewardship.” He believes if more clinicians and patients practice antibiotic stewardship, then bacteria will be less likely to grow resistant to existing antibiotics. In May, the CDC and Pew co-published a report demonstrating that one out of three antibiotic drugs prescribed in an outpatient setting are prescribed unnecessarily. Addressing the problem requires enabling scientific research that leads to the discovery of new types of antibiotics that may be less susceptible to resistance. Hyun notes that, “in the last 30 years, we really haven’t had a discovery of a new class of antibiotics.” Unfortunately, there is currently little financial incentive to develop new antibiotics. Hyun’s team’s work, in part, is to increase funding for antibiotic research. The Pennsylvania case only underscores the critical nature of the work that Hyun’s team is already doing to facilitate discoveries of new classes of antibiotics while removing any scientific, legislative, and regulatory barriers. “The mcr-1 gene finding emphasizes the urgency and need to act quickly on this issue,” says Hyun. Maggie Tennis is a writer based in Washington, DC. She enjoys adventuring in the city’s many parks, paddle boarding on the Potomac River and walking until her feet ache. Maggie believes that wellness means pursuing that balanced feeling of feeling good—for your mind, body and spirit—and sometimes that means eating popsicles for breakfast. Submit your story or essay to Buzzworthy Blogs.